Spring cleaning is not a small task, so we’ve come up with a few tips to help guide you through the process. 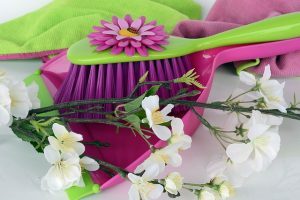 Even though it’s still super cold for most of us, spring will actually be here soon and that means one thing: spring cleaning! It’s the lovely time of year when you go through your home and tidy and scrub everything inside and out. Spring cleaning is not a small task, so we’ve come up with a few tips to help guide you through the process. Before the cleaning even begins, you should start out by making a schedule. Start with those nooks and crannies that you may not get into when you do your routine cleaning. It is super helpful to have a comprehensive checklist for every room in your home. Enlist the help of your spouse and children. Even little ones can help with small, easy tasks! Whenever you clean, you should always start at the ceiling and work your way down. You can actually make more work for yourself if you skip around. When you start at the top it forces the dust and whatnot downward: if you knock some dust off of a high shelf, you can just vacuum it up off the floor later. Your vacuum cleaner is one of the most important cleaning tools you own, so make sure you get a good one! Most importantly, your vacuum should have a HEPA filter. This filter will ensure that the dust and particulates you’re vacuuming up don’t make their way back into the air in your home. Most vacuums on the market nowadays come with a bunch of different attachments for reaching different types of spaces, such as under furniture or into tight crevices. When you’re choosing a vacuum, keep the layout of your home in mind and choose one with the right attachments for cleaning your space. If you have kids or pets in your home, you know that windows and walls can get dirty pretty quickly. Even if you don’t see anything, it’s important to clean these surfaces. If you think about it, the walls are a huge part of your home so you definitely want to make sure they are on your spring cleaning schedule! This entry was posted on Tuesday, February 26th, 2019 at 6:09 pm. You can follow any responses to this entry through the RSS 2.0 feed. You can leave a response, or trackback from your own site.